Domaine de la Janasse was officially founded in 1973, making it young within the European archetype. Prior to this date the grapes were sold in bulk to negociants, yet since Aime Sabon, the Estate’s forefather, bought the land it has established itself as one of the finest estates throughout Chateauneuf du Pape, rivalling and often exceeding, Beaucastel, Clos de Papes, Rayas and Vieux Telegraphe. In fact, in 2007 and 2010 Robert Parker awarded the Janasse Chateauneuf du Pape Vieilles Vignes 100 points; the Estate has truly joined the elite wines of the world: ‘Domaine de la Janasse is one of the great winemaking estates of not only France, but of the world.’, Robert Parker. Christophe and Isabelle Sabon have now taken over the running of the Estate from their father Aime, who imparts the anecdote that Christophe slept under the vines in the sun as a boy. Many of the vines are between 80 and 100 years old, these make up the lion’s share of their prestige Vieilles Vignes. When Aime originally purchased the Estate he increased the size of the vineyards to 15 hectares, one hectare of which is used to make their white Chateauneuf du Pape. Janasse embraces the modern style of Chateauneuf du Pape and the current generation are coxswaining the vineyard towards organic practices. Beginning in 1993 they began to de-stem some of their fruit and today 80% of the fruit is fermented without stems. They have invested in the winery using short conical shaped oak barrels to ferment the parcels of Syrah and Mourvedre, while the Grenache is fermented in concrete vats. The individual parcels are then aged in a combination of new French oak and Foudres, large French barrels, imparting a wonderful delicacy of oak and integration of flavours. The house style embodies crisp, lush and vibrant red fruit combined with delightful perfumed aromas. In terms of style it best resembles Rayas, indeed many of Janasse’s vines are similarly planted on sandy soils around the town of Courthezon, yet some argue there are richer, darker fruits in Janasse, extraordinary given its price point. Janasse make three extraordinary wines, their stellar Chateauneuf du Pape; Chaupin and Vieilles Vignes. The Chateauneuf du Pape has a tiny production of 1,250 cases per year, made from a blend of 75% Grenache, 15% Syrah and 10% Mourvedre, from old vines that are 40 years of age. Chaupin is 100% Grenache from vines planted back to 1912 and only 1,000 cases are made per year. The Vieilles Vignes is made from 85% Grenache, 10% Syrah and 3% Mourvedre, produced from vines 60-80 years of age with an average production of 850 cases per year. We will be releasing the newest vintages of Chaupin and Vieilles Vignes later this month. We continually look around for parcels of wines that we can purchase significantly below market price for our clients. Today we are delighted to have uncovered a parcel of Janasse Chateauneuf du Pape 2011, a wine that scored 91-93 from Robert Parker, which we are able to offer 40% below the average UK market price at £200 for a case of 12×75, the average market price is £275. 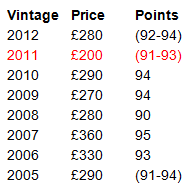 Moreover, the average vintage price since 2005 is £295 and as such the market is correctly in line with the release price and other equivalent vintages. At £200 the 2011 offers an incredible market discount, meaning you can buy one of the leading Chateauneuf du Pape wines for £16.60 a bottle, this is truly a superb wine that will age beautifully for 15 years. The Janasse Chateauneuf du Pape 2011 offers incredible value with a Price versus Points ratio of 16.6. As Parker states, ‘year in and year out, the wines, both reds and whites, are among the finest one will find … anywhere!’ A wine of this quality at this price point is incredibly rare and not to be missed. Composed of 75% Grenache, 15% Syrah and the rest Mourvedre and a touch of Cinsault, the 2011 Chateauneuf du Pape is outstanding. The Grenache is completely aged in foudre and the Syrah and Mourvedre are aged in small barrels. This flattering, precocious 2011 displays a deep ruby/purple color in addition to sweet scents of creme de cassis, black cherry jam, licorice, pepper and roasted meats. This beautiful red appears to represent a brilliant compromise between the old, traditional school of winemaking and the slightly more progressive/modern philosophies. I have followed Janasse’s Chateauneuf du Pape Chaupin since the 1978 vintage. It is 100% Grenache grown in sandy soils, and aged in both old wood foudres (two-thirds) and 600-liter demi-muids (one-third).